Hezbollah's participation in the Syrian civil war in support of the Assad regime is well-known, most notably in the captures of Qusayr in Homs province in May 2013 and Yabroud in Damascus province in March 2014. Considerably less attention has been given though to the emergence of native brands, which, if not actually set up by Hezbollah, are nonetheless identical in ideology and messaging. "The National Ideological Resistance in Syria" (NIR. Arabic: al-muqawama al-wataniya al-'aqa'idiya fi Souria) is a case-in-point. One of the logos of NIR. As becomes immediately apparent from a glance at the above figure, there is clear affinity with Hezbollah and other Iranian proxy militias, with the familiar extended arm and rifle, as well as the featuring of a globe to indicate the worldwide scope of ideological godfather Ayatollah Khomeini's vision for the 'Islamic Revolution.' 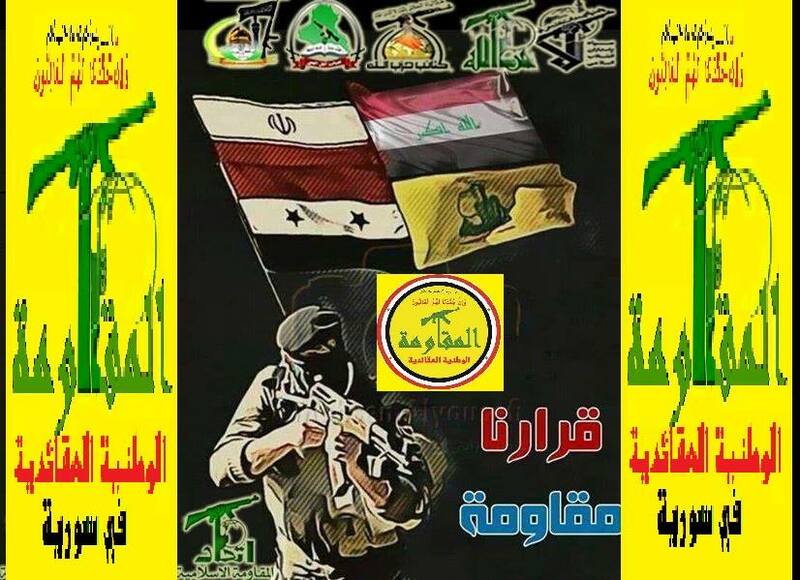 In this context, the mere use of the term muqawama ['resistance']*- popularized by Iran and its proxies- also points to NIR's alignment, which is further demonstrated with other social media graphics and logos put out in the group's name. 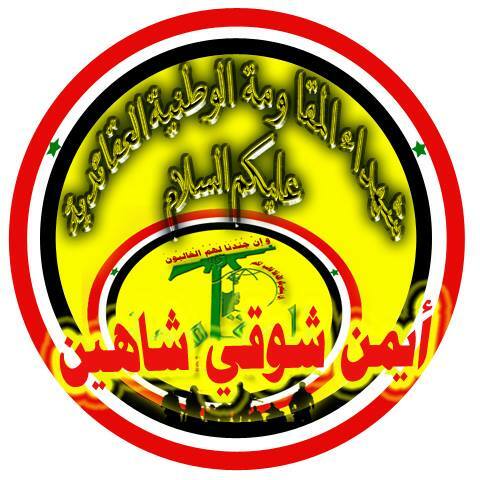 In the above logo put out by NIR social media, the group demonstrates its ideological vision combining Syrian nationalism and Khomeinism. Beginning from the left of the outer circle, we have Bashar al-Assad, Ayatollah Khomeini, Hafez al-Assad, Sheikh Saleh al-Ali (an Alawite who spearheaded a revolt against the French presence in what is now Syria soon after the First World War), Ayatollah Khamenei (Iran's current Supreme Leader, who also features prominently on 'martyrdom' posters and other social media output for Iranian proxy militias like Kata'ib Hezbollah and the Badr Organization), and Hassan Nasrallah of Hezbollah. For a further point of comparison with the previous image: from a video screenshot to accompany Kata'ib Hezbollah's song "Battalions of Iron and Fire." Note the familiar shadow-figure fighters at the bottom: cf. this videofor the pro-Hezbollah song "It has been written on the earth with blood." 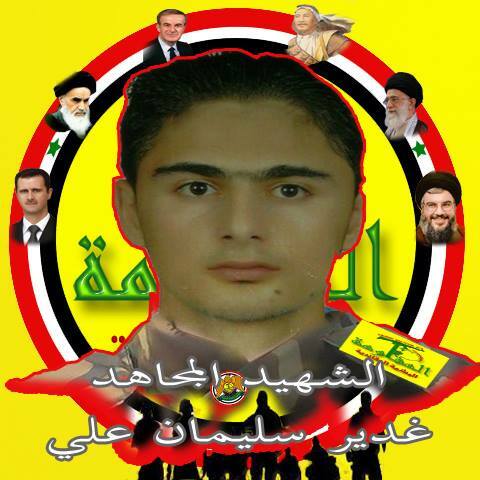 The inclusion of Hassan Nasrallah alone would not be sufficient to demonstrate NIR's affinity with the Iranian regime's ideology: after all, his face can also be found on posters of the Arab Nationalist Guard (see my profile of this pro-Assad militia group here). It is rather the inclusion of Khomeini and Khamenei as well that needs to be considered here. Yet the clearest evidence pointing to NIR as a 'Syrian Hezbollah' comes in an NIR graphic below, where the name 'Hezbollah' is explicitly used. 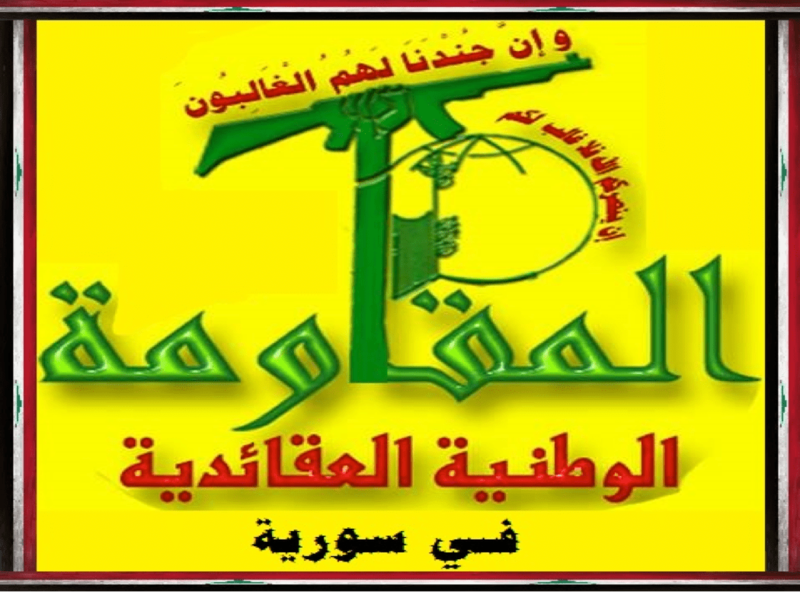 Advertising the 'military wing' also of NIR (the 'Army of the Imam al-Mahdi'- Jaysh al-Imam al-Mahdi), with the name Hezbollah below. Another NIR graphic, this time featuring the logos of Asa'ib Ahl al-Haq and Kata'ib Hezbollah (Iraqi proxies of Iran) as well as Hezbollah and the Iranian Revolutionary Guards Corps. Main featured slogan here: "Our decision is resistance." "We are from the land [i.e. Syria], in the land and on the land. We are present in all the land of Syria, all areas of Syria and all sides- resisting Syrian nationalists- resisting ideological nationalists. Our goal is to cleanse the land, preserve honour, and build souls. Our relations are good with all the honourable ones in existence [NB: referring to my question about relations with Hezbollah]. Our creed is one of love and faith. Our men, youth and cub-scouts are embarking on all the fierce battles with arms, good word, love and humanity. Our force follows from our faith, nationalism and creed…"
One may legitimately ask where exactly NIR is based and whether it is a meaningful fighting force in any way. Information indicates that the NIR movement had its beginnings in the Hama locality of Masyaf and has reached out to a recruiting base in Tartous governorate, which has been virtually untouched by the ravages of the civil war. Indeed, the group's orientation, with potential outreach to a large local Alawite recruiting pool, appears to reflect a strand of 'Shi'afication' of Alawite identity that is otherwise multi-faceted, attempting to bring it ever more in line with Twelver Shi'ism and in this case in support of Iran's system of governance of wilayat al-faqih. The emphasis on Shi'ism is also made clear in songs used by NIR in its social media: most notably the songs of pro-Hezbollah Lebanese singer Ali Barakat, who has also put out numerous hits in support of Assad. For example, one Barakat song used by NIR includes the lyrics: "It is a finest land: the mother of Khaybar [NB: Khaybar, where Muhammad subjugated his last Jewish opponents, is prominent in Shi'a militia music]. The men of God are not defeated. The Wahhabi-Salafi will not be safe. The expansion of Ali is exploding." 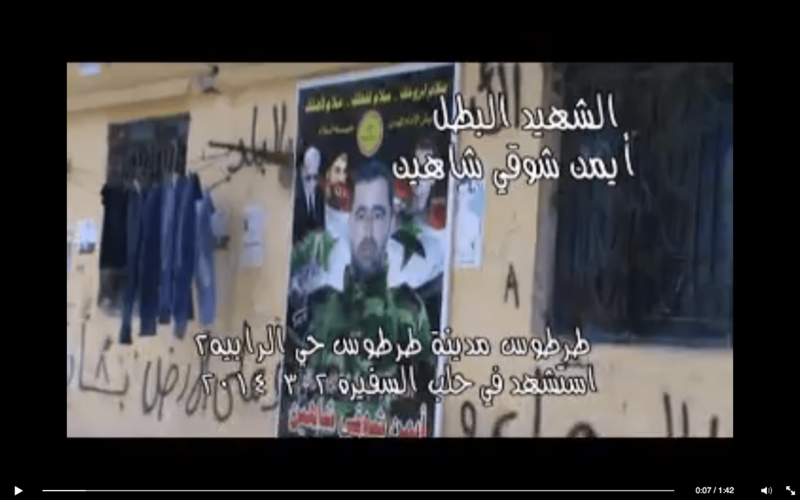 Note the NIR video includes slogans such as "Labbayk ya Ali" and "Labbayk ya Hussein" (at your service Ali/Hussein- typical Shi'a militia sectarian rhetoric). Aymenn Shawqi Shaheen. Comparison with other data shows he was reported to have been killed on 2 March 2014 in the al-Safira area of Aleppo province. He was originally from Tartous. 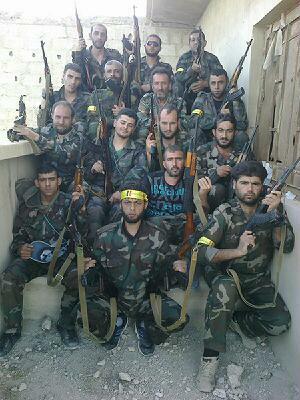 Note the Muqawama Suriya- another pro-regime Alawite/Twelver Shi'a militia- is present in al-Safira too. 'Martyrdom' poster for Aymenn Shawqi Shaheen, featuring NIR's logo etc. 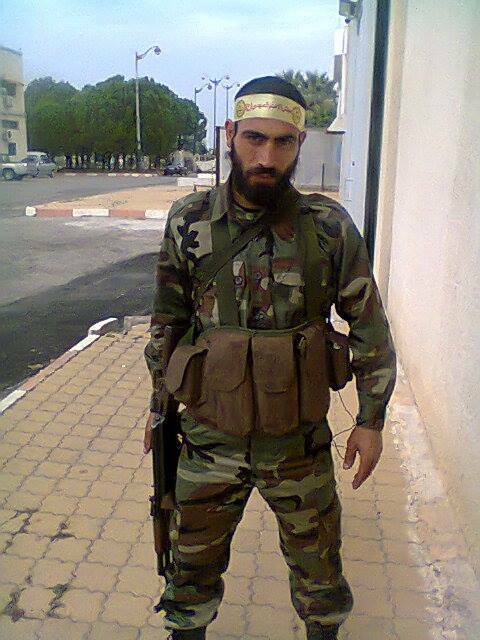 Ali Abbas: reportedly commander of the "Sheikh al-Wadi" contingent of NIR. His military efforts were said to have been known particularly in Mork, Hama province. 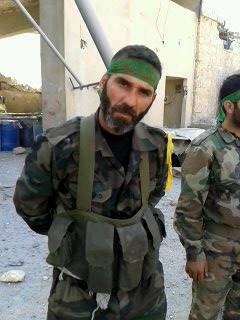 He was also hailed as the "martyr of Wadi al-Uyun," which is part of the Masyaf district of Hama province. Ghadeer Suleiman Ali: reported by NIR to have been killed in Aleppo. 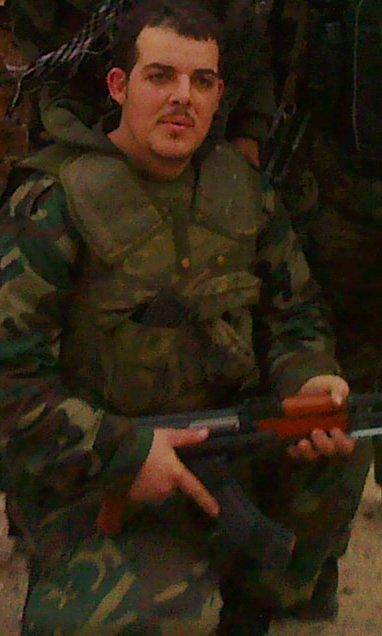 Ihab Ali Ali, reported to have been killed in Aleppo countryside on 10 December 2013. He was originally from the village of Tayshour in Tartous governorate. Note the distinct Jaysh al-Imam al-Mahdi headband of NIR. Omar al-Shayet: originally from Aleppo and reportedly killed in north Aleppo countryside. 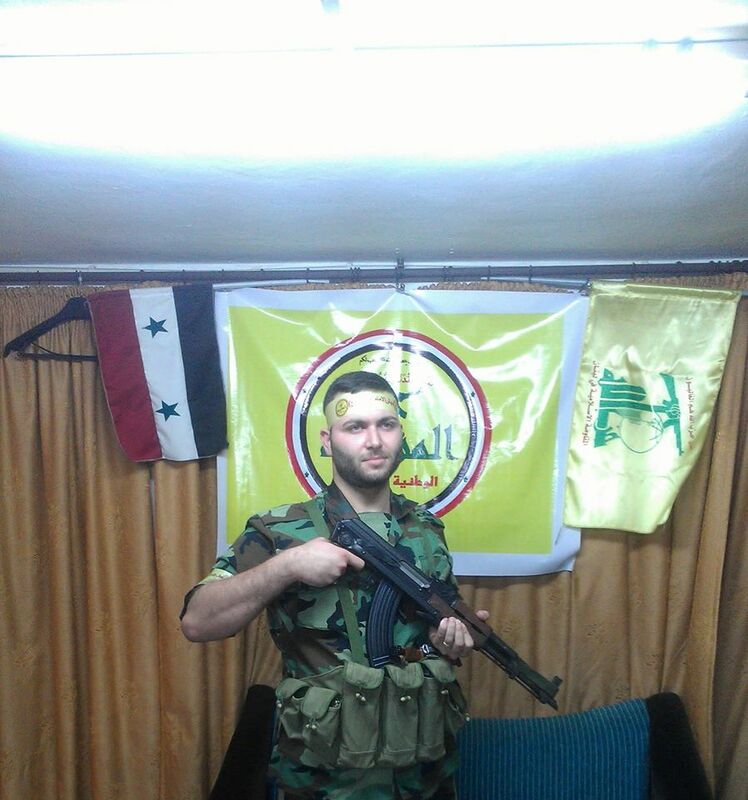 He apparently moved to Tartous but then decided to return to Aleppo to fight against the rebels. Undoubtedly he came under the influence of NIR while in Tartous. His funeral took place in Tartous on 29 January 2014. Note further this 'martyrdom' announcement for one Muhammad Muhammad Nour al-Shwaykh, who died fighting in Mork and whose burial took place on 27 May 2014 in Wadi al-Uyun. Other photos besides death announcements attest to NIR's existence as a fighting force. NIR fighters advertised by one "Sayyid Hashim Muhammad Ali," who, based in Tartous, appears to function as secretary general for the group. Photo emerged in May 2013. Mohieb Khierbek poses with his gun. 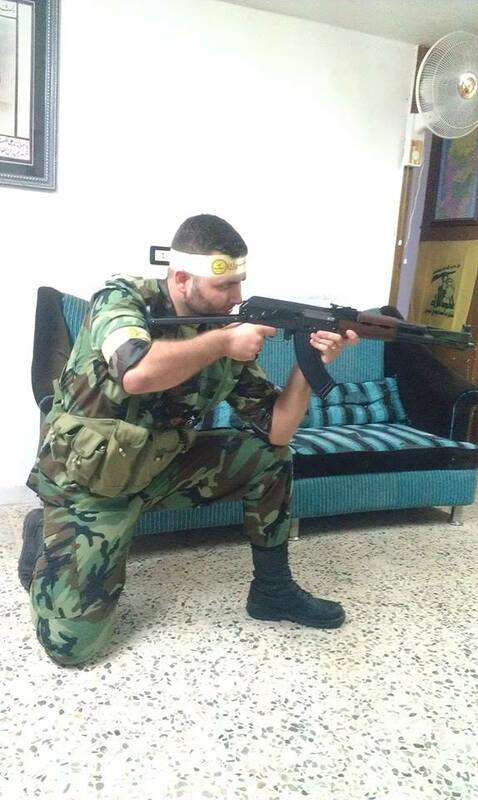 Note his NIR headband and armband as well as the Hezbollah flag in the background. 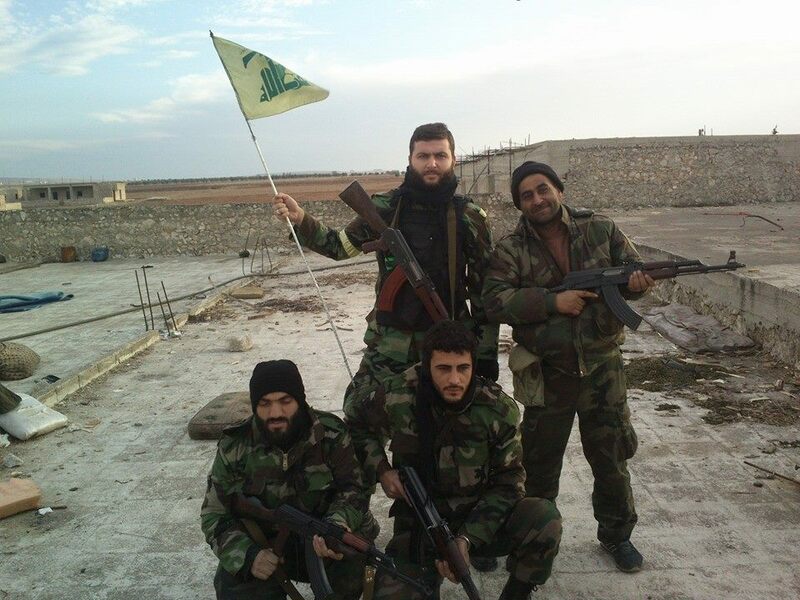 Mohieb Khierbek and fellow fighters pose with a Hezbollah flag. 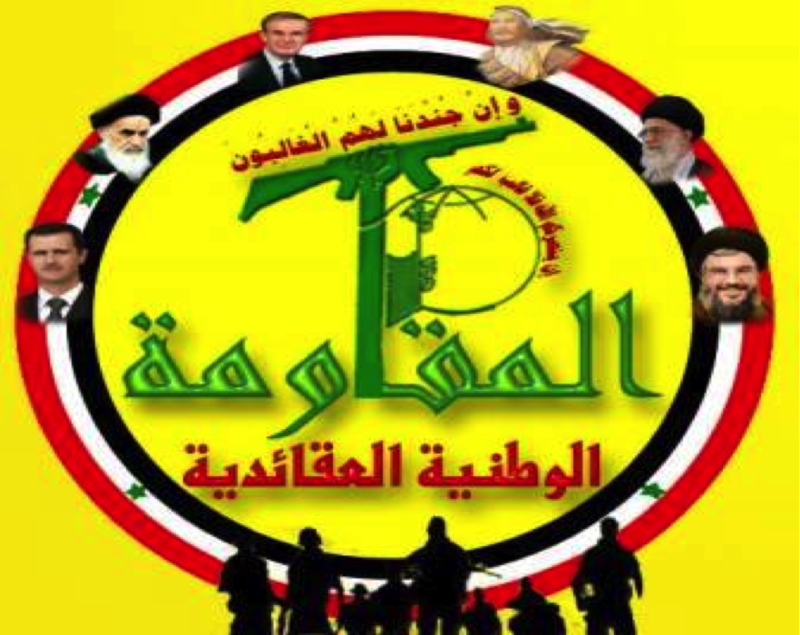 In conclusion, it can be seen how the NIR- though admittedly a rather minor militia brand- attempts to blend distinct Syrian nationalism (contrasting with the pan-Arab messaging of the Arab Nationalist Guard) with Hezbollah's imagery and ideology: hence a 'Syrian Hezbollah'. It will be of interest to see if this brand expands in the future, with the overall effect of strengthening Iranian ideological influence over Alawites and perhaps Syrian Shi'a sects more generally. 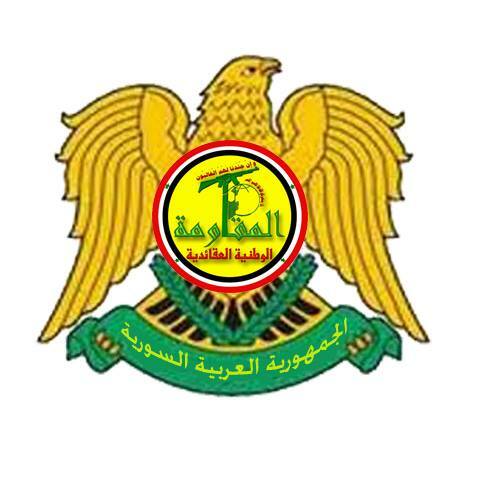 Another symbol of NIR: featuring the logo of the group inside the eagle of Syria's national emblem, with inscription "Syrian Arab Republic" at the bottom. *- In the Iraqi context, 'muqawama' is not the exclusive preserve of Iranian proxies and the Shi'a more generally. Non-Islamic State Sunni insurgent brands- such as the Islamic Army in Iraq- also deploy the term as an identity symbol. The genesis of this article was due to a query put to me about NIR by Syria Conflict Monitor on Twitter. Aymenn Jawad Al-Tamimi is a Shillman-Ginsburg Fellow at the Middle East Forum and a Rubin Research Fellow at the Interdisciplinary Centre. - In the opening of this piece, I wrote a conditional- 'if not actually set up by Hezbollah'- but I am more inclined to see this group and any other 'Syrian Hezbollah' brands as the creation of Hezbollah. For further note, Syria Conflict Monitor points out to me that much of the reported presence of Hezbollah aiding the regime in Hama- with evidence of Hezbollah insignia and the like- points back to NIR. - NIR is not the only pro-regime militia brand in Masyaf. The Muqawama Suriya, whose Alawites do not espouse a Shi'a identity aligned ideologically with Iran, also has a branch in Masyaf. In future, it will be of interest to see if these differing brands end up competing for local support and clashing, whatever public 'brotherology' may be espoused.